Douglas MacDonald from Charlottetown, P.E.I. was honoured by Ducks Unlimited Canada (DUC) with The Queen Elizabeth II Diamond Jubilee medal at a ceremony on February 8, 2013. The medal serves to honour contributions and achievements made by Canadians who represent the full breadth of our society. DUC, as a national conservation leader, was given the privilege by the Government of Canada to nominate worthy individuals as recipients of the medal. An extensive national search and selection process was undertaken by the Nominating Committee of DUC's Board of Directors. Thirty Canadians have been nominated by DUC and are being recognized by the organization at ceremonies in their local areas. "Ducks Unlimited Canada was honoured to be able to nominate outstanding Canadians for this prestigious medal," said Jack Hole, Chairman of the DUC Board and Nominating Committee. "Douglas MacDonald is a great leader, passionate conservationist and true friend to Canada's conservation community. Through his support of Ducks Unlimited Canada and other worthy organizations, he has made tremendous contributions to wetlands, waterfowl and the overall health of the environment." "Doug has played a critical role in advancing Ducks Unlimited Canada's conservation program in P.E.I.," said Tom Duffy, manager of Atlantic operations. "As a recipient of this medal, he joins a small but influential group of Ducks Unlimited Canada conservationists across Canada." A new commemorative medal was created to mark the 2012 celebrations of the 60th anniversary of Her Majesty Queen Elizabeth II's accession to the Throne as Queen of Canada. To view the photo, please visit the following link: http://media3.marketwire.com/docs/JubileeFeb8_800.jpg. Caption for photo as follows: Douglas MacDonald from Charlottetown was awarded with The Queen Elizabeth II Diamond Jubilee medal for his contribution to conservation and his work with Ducks Unlimited Canada. From left to right: Tom Duffy, Douglas MacDonald and H. Frank Lewis. Photo courtesy of Ducks Unlimited Canada. To view the bio information of recipients, please visit the following link: http://media3.marketwire.com/docs/PEI-bio-MacDonald.pdf. Ducks Unlimited Canada (DUC) is the leader in wetland conservation. A registered charity, DUC partners with government, industry, non-profit organizations and landowners to conserve wetlands that are critical to waterfowl, wildlife and the environment. Learn more at www.ducks.ca. 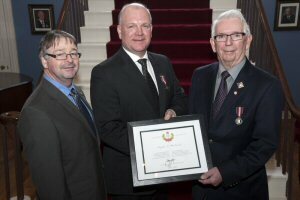 Douglas MacDonald from Charlottetown was awarded with The Queen Elizabeth II Diamond Jubilee medal for his contribution to conservation and his work with Ducks Unlimited Canada. From left to right: Tom Duffy, Douglas MacDonald and H. Frank Lewis. Photo courtesy of Ducks Unlimited Canada.